In the summer of 1979 I had the privilege of participating in an archaeological dig in Israel at Tel Batash, the biblical city of Timnah (cf. Judges 14). The archaeological dig itself was very fascinating and also very hard work. But the additional touring our group was able to do throughout the land of Israel was transformative. It forever changed the way I read and understood the Bible. Ever since that summer decades ago, I have looked forward to the day when I might lead a group back to Israel. And now the timing seems right and the date is on the calendar. 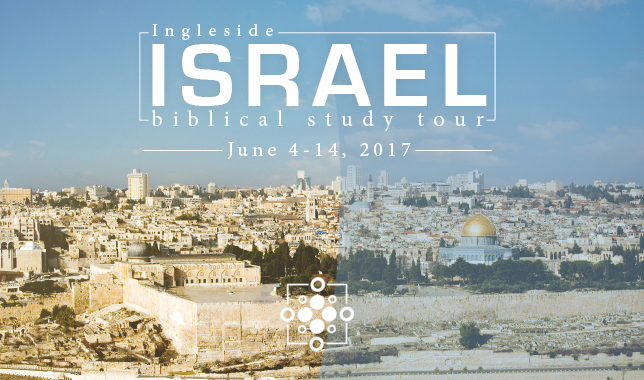 So, the Lord willing, Beverly and I are planning to lead an Ingleside Israel Biblical Study Tour on June 4-14, 2017. And we hope you will consider joining us! We will have an informational meeting to provide details related to the trip on Sunday afternoon, May 15, at 5:00 p.m. in Room W-200 at Ingleside. We’ll share lots more information about itinerary, what to expect, cost, how to reserve your spot, etc. When: Sunday, May 15 – 5:00 p.m.
Sign up for participation on the trip will be limited to Ingleside members (and accompanying family) until the end of 2016. Beginning on January 1, 2017, if spaces still remain, they will be made available to a wider audience. If you think the timing may be right for you to make such a trip, I hope to see you on Sunday afternoon, May 15.